Torq is consistently working to expand its rail terminal network. 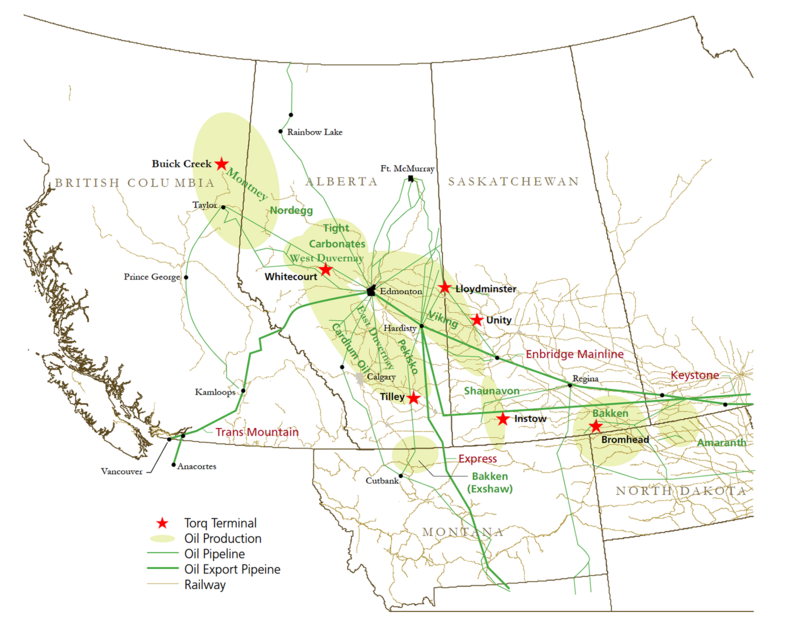 Torq is actively working to expand, build and acquire additional midstream infrastructure in western Canada and the US. 14-08- 03-13 W2. 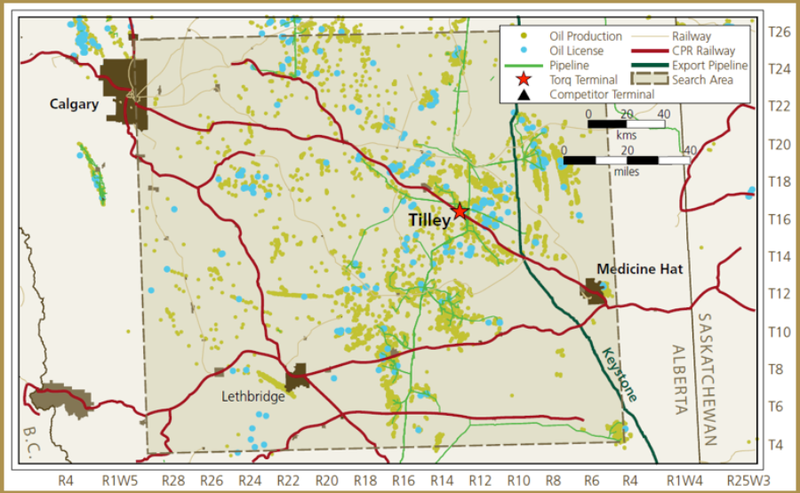 Located approximately 60 km south of Weyburn SK, 60 km west of Estevan, SK, and 15 km north of the U.S. border. 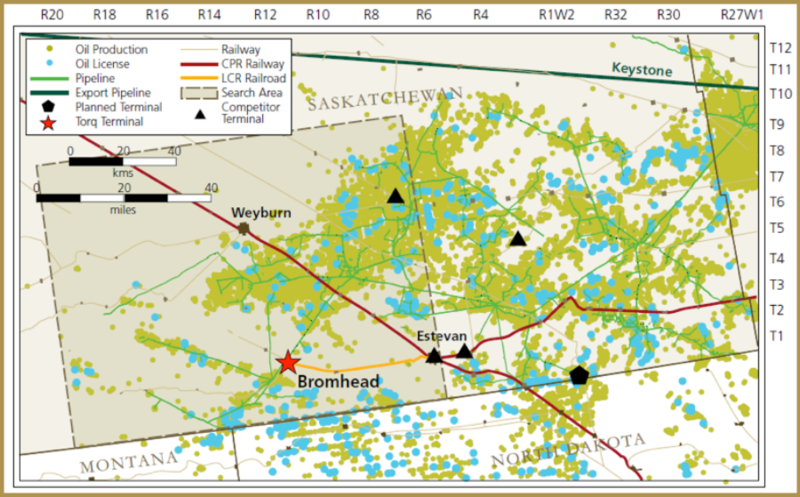 Located on Long Creek Railway (“LCR”), a shortline which interchanges with CP in Estevan, SK. Current capacity of approx. 80 railcars. Crude oil, frac sand, condensate and NGL’s. Midale, LSB and Bakken crude. B 8-B / 094 A 14. 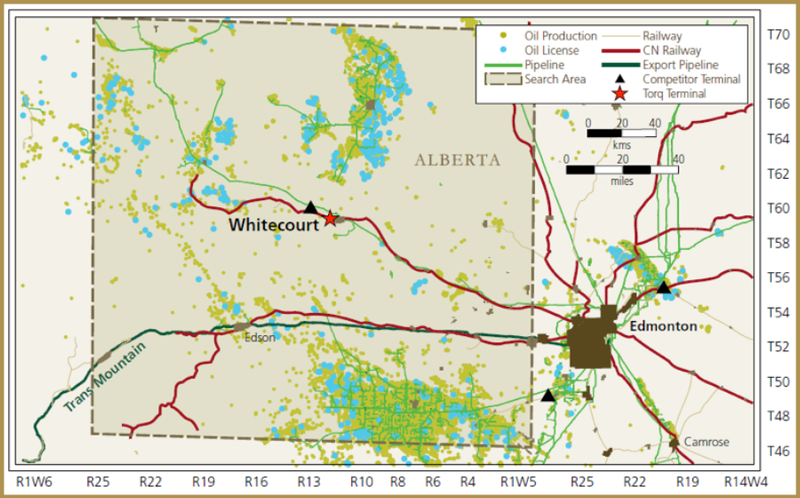 Located approximately 75 km north of Fort St. John, BC. Frac sand, hydrochloric acid, pipe, etc. 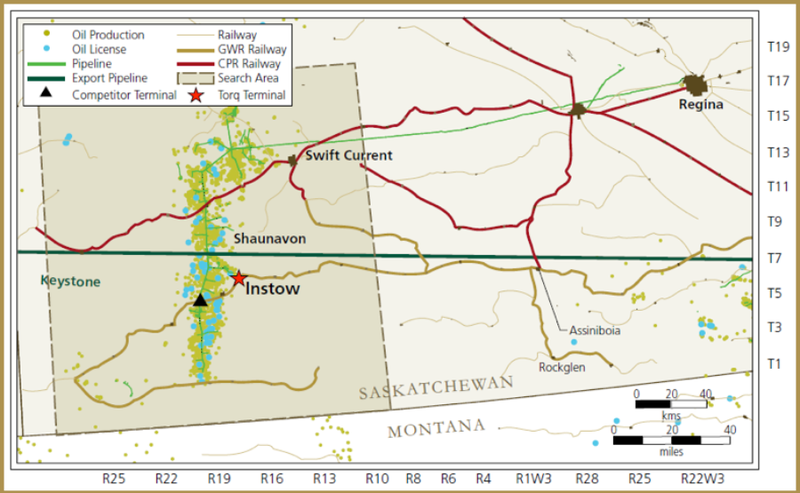 Great Western Railway (“GWR”), a shortline which interchanges with CP in Assiniboia, SK. Current capacity of 30 cars. Crude oil and frac sand. Current capacity of 44 cars, with ability to expand to 100+ with 24 hour operations. 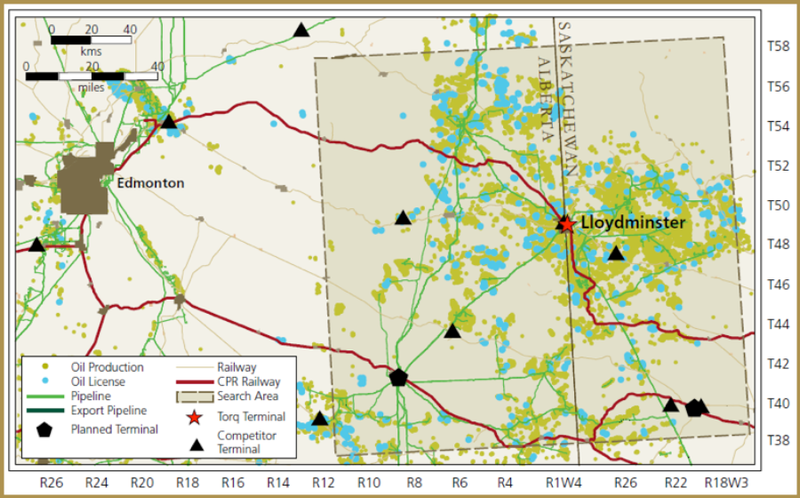 Conventional heavy undiluted Lloydminster (LLB), Kerrobert (LLK) and Cold Lake. 06-19- 17-12 W4. Tilley, Alberta; 1 km from town. Current capacity of 50 cars. Conventional heavy Bow River north and south crudes as well as Alberta Bakken. 04-34- 59-12 W5. Whitecourt, Alberta; 3 km from town. CN, within the railroad’s local yard. Current capacity of 20 railcars with substantial land to be able to expand. Crude oil, hydrochloric acid, methanol and frac sand. Cardium, Beaverhill Lake / Swan Hills and Peace River. 04-16- 40-22 W3. Unity, Saskatchewan; 1.5km east of town. Dually connected to both CN and CPR main lines. Terminal is connected to the shortest rail line haul from Western Canada to US Gulf Coast for heavy undiluted crudes. Unit train capacity of ~140 railcars currently with substantial land to be able to expand. 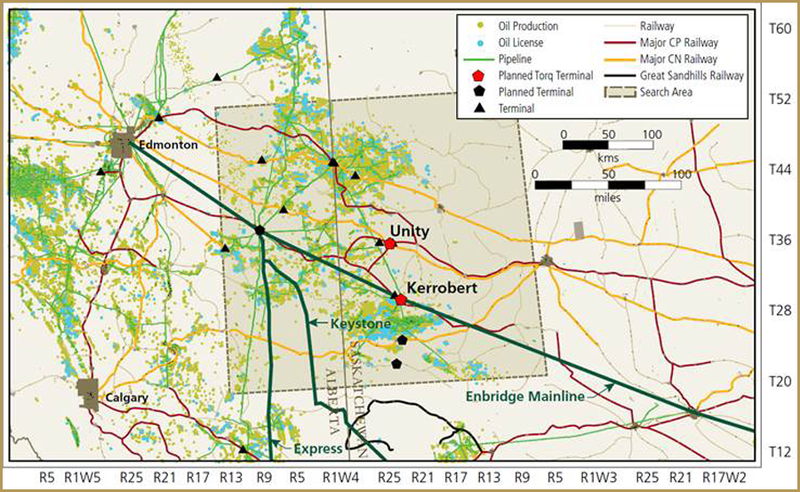 Conventional heavy undiluted Lloydminster (LLB), Kerrobert (LLK), Bow River North and Kerrobert Sweet (Viking).